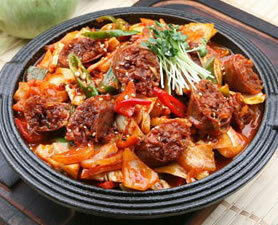 Soondae bokum is a spicy stir-fry soup variation of sliced soondae sausages and noodles in a mild pork or even ox bone broth. Other ingredients can contain but not limited to pig tripe, liver, vermicelli noodles, onions, sesame leaves, and many other vegetables. It’s usually served in a milky broth in a black ceramics bowl with a bowl of steam white rice which can be added into the broth for an even heartier meal. Some restaurants also serve condiments such as hot peppers, coarse chili sea salt and fermented micro-shrimp dipping sauce that compliments the soondae’s sweetness in taste. Other side dishes or banchans that are present alongside this is kimchi or kkakdugi and some restaurants may serve this dish spicy by adding gochujang and crushed hot peppers.